This is a phenomenally well written tome about the tribulations and triumphs that took the University of Washington Men’s team to Olympic Gold in Berlin. The narrative largely focuses on Joe Rantz, a boy abandoned by his family, who had the temerity to attend UW, where he promptly fell in love with rowing. His teammates, most of whom had never rowed before, were strong kids from logging camps and fishing boats; skills that would translate well into the grace and power that a shell exacts from its’ rowers. I think that this book was particularly poignant to me because I am a Pacific Northwest rower who has lived in Seattle for many years, and this book does an exceptional job of weaving in early Seattle history and University history, within the context of the greater societal pressures taking place around the country and the world. The book also details Mr. Pocock, a quiet boat builder from England who came to Seattle and made the fastest, most advanced boats conceivable, giving the UW teams an extra edge. To this day, having rowed Vespolis, Empachers, Aldens, Resolutes and WinTechs myself, my experience in a Pocock shell is unparalleled. The boys train beyond what they think are the limits of their physical capacity in rain and sleet and snow, and after some harrowing wins to other more well recognized (and well funded) universities, the boys have a chance to take their boats across the Atlantic to compete and win on German turf in 1936. 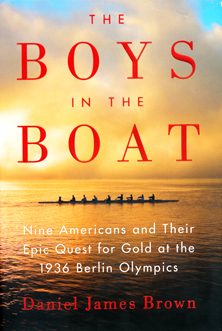 If you are from Seattle, if you are a rower anywhere, if you have a interest in German-American relations leading up to the 1936 Olympiad, then this book is for you.